Welcome back to another raucous and titillating episode of What’s Poppin’ in the Powder Room. Reminder… the below photo was the beauty I started with. I added the wallpaper right when we moved in, but there wasn’t much else about this room that I liked. 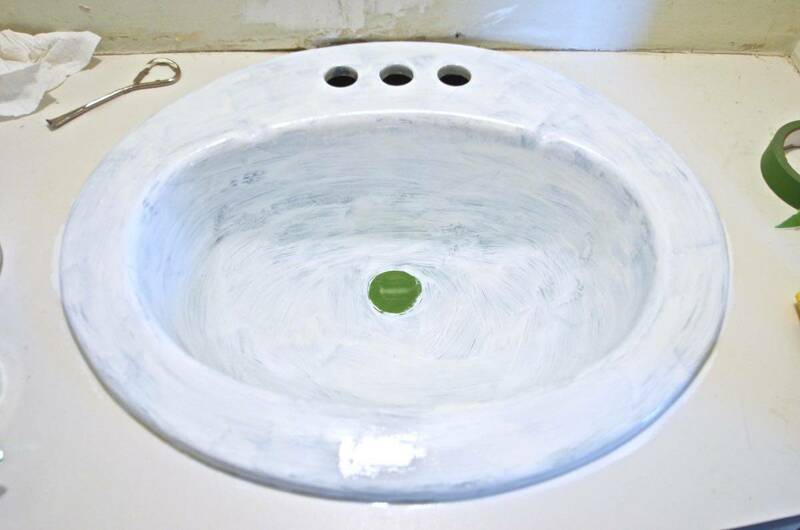 Today I’m sharing one of the biggest ‘bang for your buck’ DIYs… how to PAINT a sink! 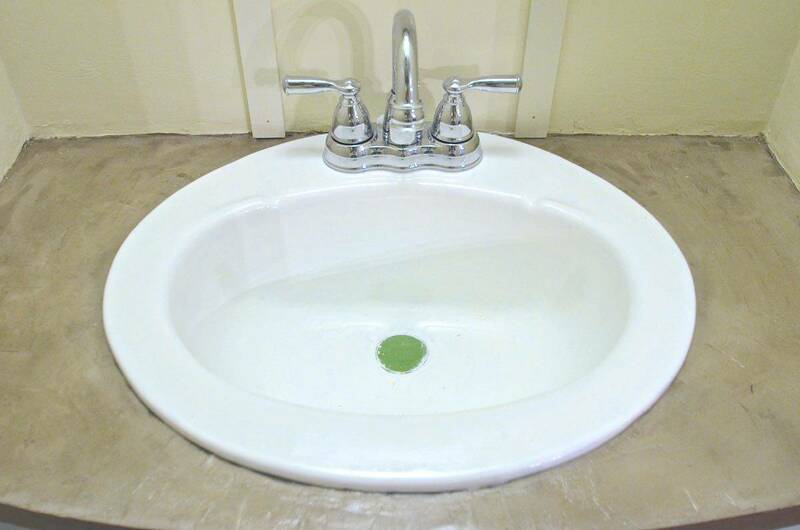 But, before I could deal with the sink, I had to remove the faucet… I’m no plumbing expert, but this was easy. Shut off the water to your sink and do some stretching because the hardest part about working on a sink is getting your body in the right position to do anything. 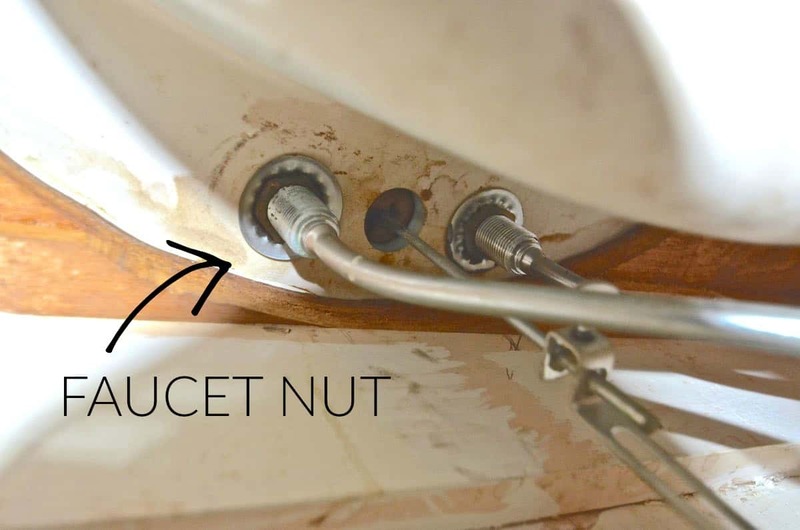 Disconnect your water lines from the faucet… ours was obvious with two large nuts that unscrewed and released the hot/ cold water lines from the faucet itself. 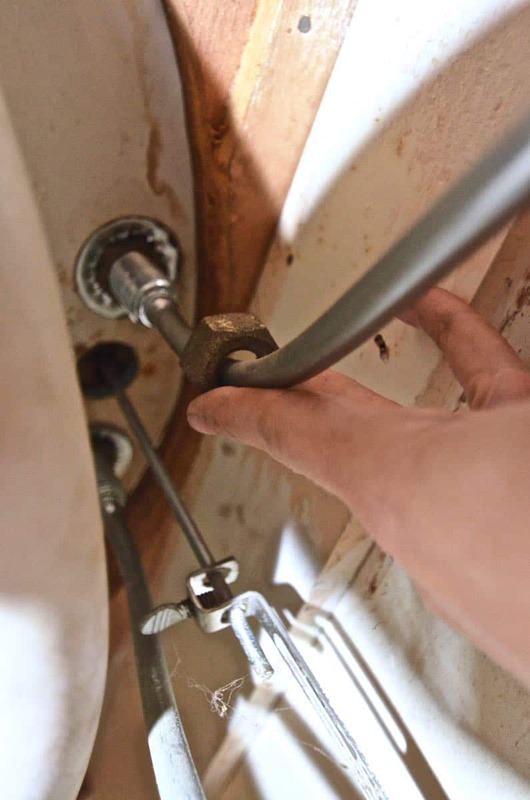 If you look under your sink, the actual faucet and knobs are a attached to the bowl of your sink with two nuts. (affiliate) to unscrew these nuts. And full disclosure, I could only crack one of them, so I actually did send out a bat signal for our amazing plumber to come over and help with that one nut. (That’s what she said?) Once the faucet was removed, time to tackle the sink. 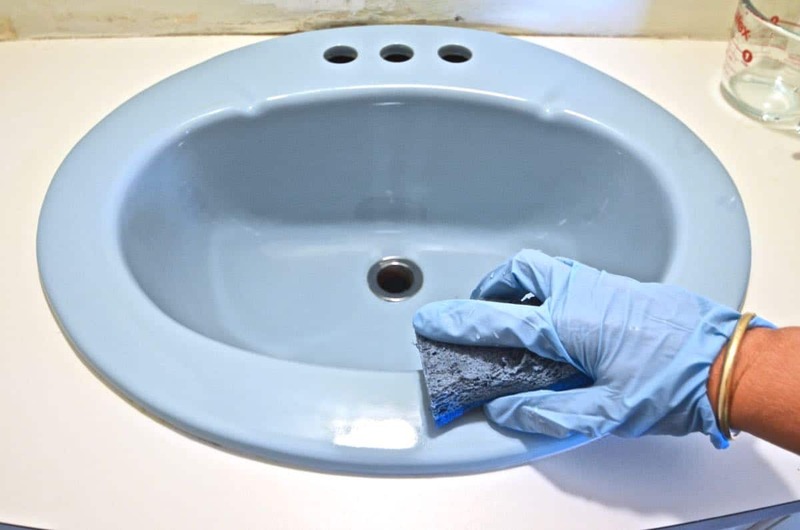 Once you’ve cleaned and scrubbed your sink a few times, you apply one light coat of the epoxy with a good quality brush (not a roller or foam brush). The epoxy is self leveling so you don’t have to worry too much about brush strokes, but you do need to be careful about drips, etc. After 3 hours, you can apply a second coat. (If you wait longer than 4 hours, you need to wait the full 72 hours for the epoxy to cure… so set your timer!) First coat is above… second coat below. 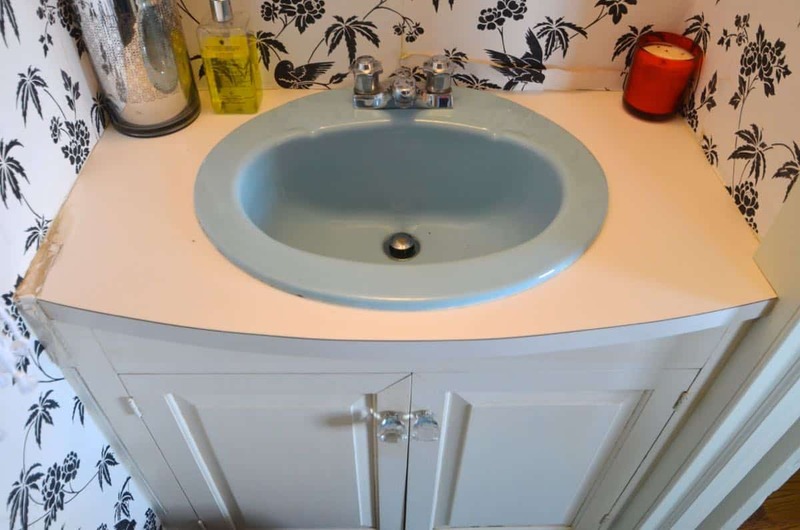 Apparently our 1970s turquoise sink is ‘dark’ so I needed to give it a 3rd coat. Problem is that you need to wait 72 hours for the sink to fully dry before applying this 3rd coat so I was sort of in limbo with the rest of the powder room waiting for this step. Bright and early Saturday morning, and 3rd coat went down. Here’s what I can say about this process. If you are looking for a perfectly white porcelain sink like you can buy at the store, this probably won’t satisfy you… I don’t think it’s obvious or offensive, but you can definitely tell that this has been painted. (They sell a spray version, but I wasn’t about to pull out the sink just to try the spray…). That said, I am COMPLETELY pleased with this result- it’s exactly what I wanted and for $35 and NO plumbing, this is perfect. Would I do this in a brand new bathroom? Nope. But to rejuvenate a dated bathroom without spending a fortune, this was exactly the product I was looking for. I also swapped out the faucet so for another $50, the whole sink is new and majorly improved! By the magic of the internet, you can check out the finished power room reveal HERE. You can also see how I worked some magic with a salvaged door HERE. I never knew this was a DIY!! 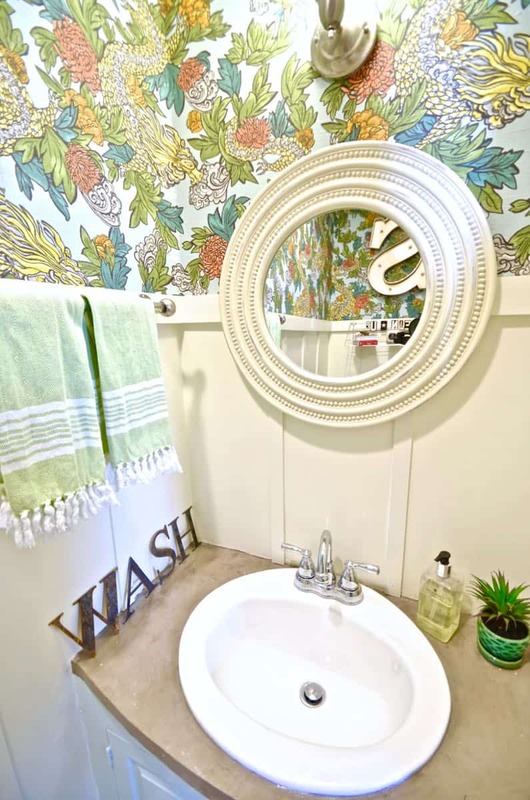 I had my bathroom wall tiles and tub painted professionally to get it ready to put on the market, but it was a big procedure, akin to painting a car, smelled terrible, and was very $$$!!! I know your job was much smaller, but had no idea that Home Depot sells such a kit. Thanks for an entertaining and helpful tutorial. I think for a tub I’d go the professional route because there’s so much wear and tear. I’ve seen other bloggers paint tile with great success and for a powder room sink that won’t get much action, I’m optimistic! Fingers crossed! This is such a great upgrade! I also love your honesty about the fact that it’s not perfect. Sometimes it’s so hard to tell if people are being honest about their experience with some products! Thanks, Sarah! I know what you mean… Compared to the old sink, this paint KILLS… but you would probably guess it was painted if I made you inspect it. 🙂 Still… works for me!! Can’t wait to try it. 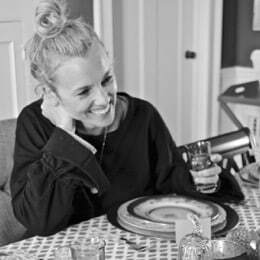 (actually I would love to wait to try it but I just came home from a ladies conference and my husband had demoed the bathroom) we had been discussing it for a while but a leaky toilet pushed the issue. 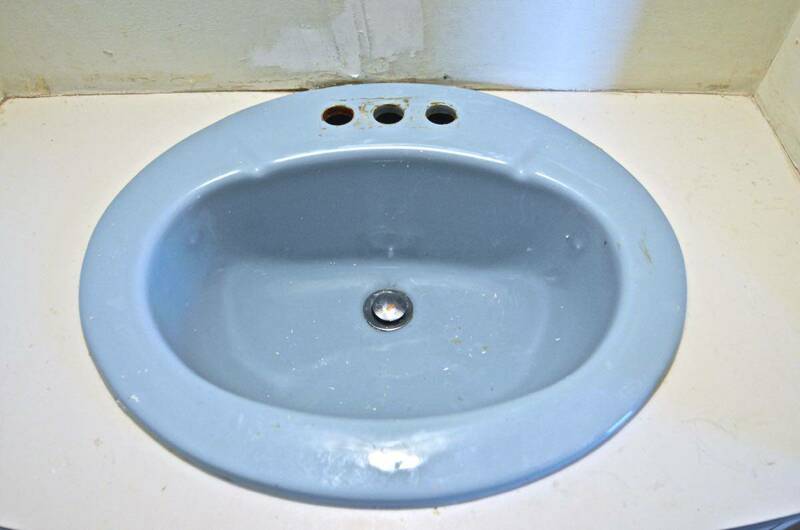 so the ugly 70s mauve toilet and tub are gone but I have 2 sinks and don’t want to replace the whole vanity. and they are a cool square shape that I actually like. so here goes. Sounds like a sister bathroom to ours! That’s exactly how I felt… I figured if it didn’t work, I could demo the whole thing, but the aqua sink HAD to go… Be diligent about cleaning it first and use a fine bristle brush and I suspect you’ll be pleasantly surprised! I had to use 3 coats which was the only thing. Meant a 72 hour pause after the first two coats! Good luck!!! Would this cover up cigarette marks left on the edge of the sink? My sink looks terrible and I’ve tried everything to get that brown sickness off. Hi Danielle, Cigarette stains can be tough as they have a tendency to bleed through paint. That said, this is a pretty heavy duty epoxy based paint and I would assume it has the muscle to keep those stains at bay. 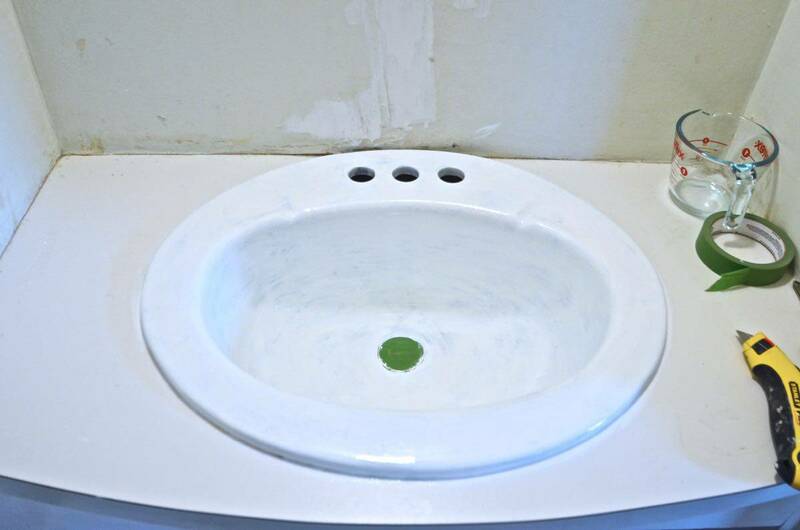 If your sink is white, then you have nothing to lose! Keep me posted! You mentioned a concrete finish on the vanity. What did you use? I was considering trying to fabricate a solid concrete top for my bathroom. Using a product on the existing counter would be far less time consuming. Several years ago I refinished my tub using a spray kit. It looked great, bought me several years and I’m considering doing it a 2nd time. Love your new bathroom. Isn’t it amazing what we can do on a budget!! Good luck! 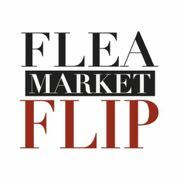 ANd yes… I learned a bunch of new tricks as a result of this budget makeover. It’s easy to have confidence to try anything when the alternative is so ugly! Thanks so much, I have that product written down if I’m ever at a Home Depot (Lowes doesn’t carry it). Just hadn’t seen any comments from someone that had actually used it. Nice! We had a tub and tile surround in the same lovely color and used the Rustoleum brand of the same kind of epoxy. The smell was unreal and it was a LOT of work, but I’m so glad we did it (now that we’re finished). The transformation is amazing, isn’t it? Ah yes, Hollywood lights. We’ve replaced those in our last two houses and it makes a world of difference. Our current master bath had TWO sets; you all but needed those protective tanning booth goggles. They were so hot I burned my arm while standing on the countertop while stripping wallpaper. Love it! So down to earth…hey it’s OK if it’s not perfect. Sure looks better!!! And there is no house decorating police that will come after you! Great sensible ideas. Thanks! HA! Thanks! It’s MUCH easier to take risks when the worst case scenario is replacing something that HAS to go anyways! I just finished painting some tile in our new house and am SO glad for this first experience with epoxy paint! I just used the Rust Oluem Tub & Tile on my bathroom sink, however there are many dried on drip marks. Help, I do not know how to fix this. Should I sand down the parts that have drip marks and re spray in a day or two? Oh goodness! I think I would try to sand it down as best I could and paint again! I’ve never used the spray but if you can get rid of the drips with sand paper, next time try holding the spray paint further away and giving a lighter coat. Good luck! Ha! Maybe… with these old houses… it’s NEVER that simple, unfortunately! 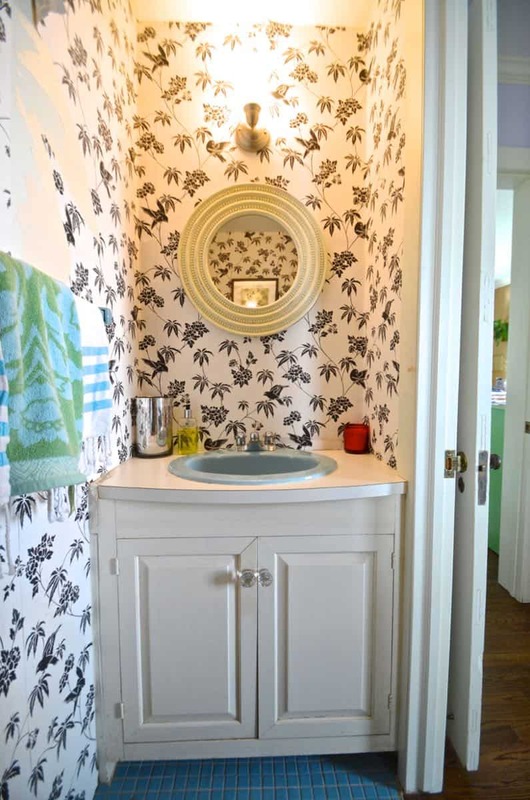 I just saw this and realize its several years after the faCt but…im pissed at the previou owners for painting tile, tub and sinks in all the bathrooms. We had to completely gut them to get rid of the thinning, peeling paint the owners had professionally done in order to sell the house. Looked great when we moved in but took just a few weeks to start peeling and chipping. Please dont ever do this! I guess that’s just something to keep an eye out for that when purchasing a home! For us, the space needed to be gutted so this bought us a couple of years.